StopTech AeroRotor Replacement Kits (ARK) are designed to replace your vehicle’s original factory rotors, while retaining the factory brake calipers. Although the ARK is the same diameter and thickness as the factory rotors, it offers improved cooling, braking, and handling. The directional, floating AeroRotors allow independent expansion of the rotor and hat without “coning,” thanks to elongated drive pin holes. ARK components include AeroRotor friction rings with patented internal vane design, pre-assembled to billet aluminium AeroHats with directional stand-offs that optimize cooling airflow. The patented AeroRotor vane design pushes up to 80% more air than factory rotors for better cooling and reduced fade on the track. The aircraft-grade aluminum hats and 2-piece AeroRotors are up to 8 pounds lighter than stock rotors, allowing faster acceleration and deceleration, and improved handling. StopTech AeroRotors are available slotted or cross-drilled. These slots or holes allow better dissipation of heat, friction material and debris, assuring that fresh pad material is in contact with the rotor every time the brakes are applied. An optional anti-corrosion, zinc finish is available for customers in cold climates, where salt and chemicals are used to melt snow and ice. The zinc coating also benefits customers who prefer no visible surface rust on the vanes and outer circumference of the rotors. StopTech AeroRotors are 100% made in the USA. The patented 2-piece AeroRotor assembly uses uniquely designed and patented AeroVanes inside the disc to optimize airflow through the rotor. This improved directional design minimizes turbulence and flows up to 61 percent more air than any other rotor tested. 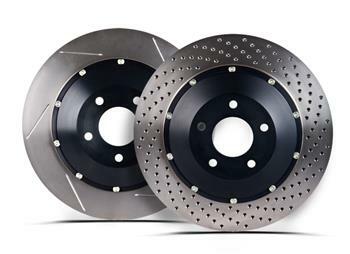 The result is up to 80 percent better airflow over original equipment rotors and 10-30 percent better airflow than other directional vane racing rotors currently available. Better airflow equals better cooling, and better cooling means less fade and better overall brake system performance. StopTech AeroRotors also feature a proprietary alloy chemistry. By adding molybdenum to the gray iron, carefully targeting a narrow range of hardness and tensile strength values, and controlling the cooling rate of the rotor after casting, StopTech produces a friction ring with added crack resistance as well as improved functionality. Super strong Inconel drive pin washers – as used in aircraft engines and other racing applications – are practically impervious to oxidation or corrosion even at extreme temperatures. Street rotors use a curved drive pin washer to add tension to the hat assembly, reducing rattle. Race applications use a flat washer that allows full freedom of movement between hat and friction ring. StopTech AeroHats feature directional stand offs to further improve airflow and cool the rotor. Elongated drive pin slots allow separate expansion of rotor and hat to resist coning. Tapered slots allow evacuation of debris that might otherwise accumulate with straight-cut slots. Drive pins used to affix the hat to the rotor have a slightly out-of-round hole and are self-locking. They withstand high temperatures much better than typical lock washers and allow drive pins to move freely, yet securely, as hat and rotor expand at different rates. In certain applications where packaging is an issue – such as on the Chevrolet Corvette – StopTech uses slant-head drive pins to provide improved clearance as pads wear.